(Image from the Public Health Observatory - Saskatoon Health Region, 2014). Partnering with community-based and state organizations, we are working to provide opportunities for all residents to create healthy futures, regardless of their socio-economic background. 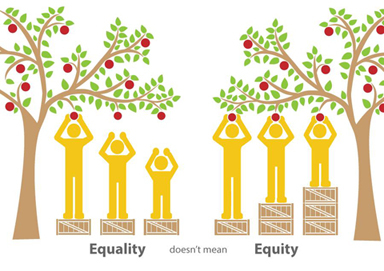 Our local Health Equity Advocacy Committee is working to educate and engage the public and policymakers to expand conversations about inequalities preventing racial, ethnic, low-income and other vulnerable populations from a fair chance to achieve good health. Early childhood development, schools, education and literacy. Economy, jobs, employment, occupation, working conditions, income and wealth. Housing, transportation, public safety, parks and recreation and access to healthy food. Social status, culture, social network, political clout and justice. Good health depends on more than medical care. We are working to understand the root causes of health disparities and encourage sustainable changes to help all residents lead healthy and productive lives. Some of the many social determinants and questions to consider when addressing how they can impact your health. From the Colorado Trust. 2013 report from the Colorado Department of Public Health and Environment. Mission: To ensure that every Coloradan has an equal opportunity to achieve their full health potential. Part of the Colorado Department of Public Health and Environment. Advisor to Office of Health Equity. Addressing the social determinants of health through healthy public policy to achieve health equity among all Coloradans. From the Colorado Department of Public Health and Environment. Toolkit and Practical Guide from Windsor-Essex County Health Unit.